He is right that the settled, post-Cold War world order is now definitely slipping away into history and we must rise to the demands of a new range of threats. It is becoming more and more apparent that this is where we are, with Russia’s multi-level military and naval intervention in the Syrian Civil War and China’s aggressive pursuit of control over the entire South China Sea. They are using means that a generation ago would have seemed utterly impossible for those states to even try. Just as China has designs on controlling the South China Sea (and the natural resources under its seabed) so does Russia intend to control the Arctic (and anywhere else it can get away with it unchallenged militarily by the West). And then there is the terrorist group ISIL, which recently launched terror attacks in the French capital and has taken control of large swathes of territory in both Syria and Iraq. It has become Terror Central, presiding over a devil’s playground for sick-minded thugs intent on bestial acts that masquerade as being on behalf of Islam, but are about as Islamic in the true sense as the Nazis were socialists. It is perceived that the ISIL threat cannot be tackled by conventional means, that lone wolves carry out attacks, including the massacre of British and other European tourists in Tunisia. This is not necessarily true. The perpetrators are trained in Syria, or in some other ISIL enclave. They obtain their weaponry from suppliers close to their targets and are assisted by networks guided by commanders in the safe havens (wherever terrorists now lurk across a vast arc of chaos and conflict). These ungoverned spaces have been partly created by the unwise military interventions of Western powers that had a short attention span militarily and certainly no comprehensive strategy for what came afterwards. These, then, are the multi-level threats that confront the West today and it may well have to cooperate with uncomfortable bedfellows (such as Russia and Iran) to eliminate the primary danger (ISIL). But, make no mistake, a greater reckoning in world affairs looms. Beyond the struggle against ISIL, which can be conducted using air and sea-based forces, Special Forces and – most important of all – regional military players providing ‘boots on the ground’, there is a new geo-strategic contest. It will require firm and nimble diplomatic and political initiatives along with strong and powerful, yet carefully calibrated, conventional military responses. Just as the British and Americans joined forces with the Russians to defeat the evil of the Nazis in WW2, then settled down into the Cold War confrontation with each other, so, beyond the ISIL battle looms a new face-off. It will be trickier than the Cold War, which had arms limitation treaties to restrain it. Russia is now developing weapons that it would never have dared contemplate making during the Cold War. Naval forces will be key players on both sides and while the Americans, Chinese and Russians need no convincing of the urgent necessity of properly equipping their maritime forces for the contest, Europe’s defences remain moribund. They are under resourced, tiny and, frankly, inadequate. Britain’s recent defence review was largely window dressing, promising new ships and maritime aircraft, trumpeting massive capital investment in a few flagship projects, but in reality failing to solve the deeply embedded problems created by the UK’s calamitous 2010 defence review. Proper defence requires military forces to be poised and ready with enough critical mass and presence to deter foolish moves that might result in disastrous wars. The UK and other European powers, with the possible exception of France, possess only gesture conventional capabilities. They deter nobody and make it more likely that easily avoided conflicts will happen. And atomic weapons – proliferating across the world as never before – can only work as a deterrent (designed never to be used in reality) if there are sufficient, strong conventional forces to enable the drawing of red lines across which putative foes dare not cross on the path to the threat of a nuclear exchange. Nukes of any kind can never be weapons of first choice. The front line of defence has to be astute and determined diplomacy backed up by the threat of credible conventional force (with the nuclear deterrent lurking far, and well hidden, in the background). 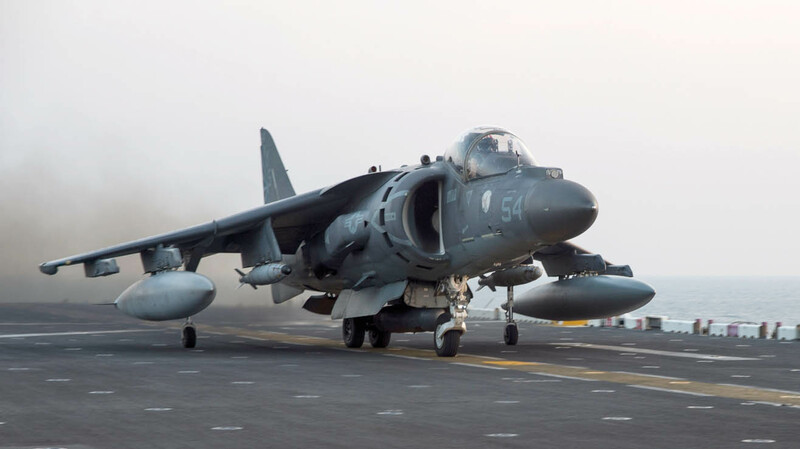 Today’s conflict against ISIL: An AV-8B Harrier launches from the amphibious assault ship USS Kearsarge to conduct strike missions against terrorist targets in Iraq. Photo: Ryre Arciaga/US Navy.